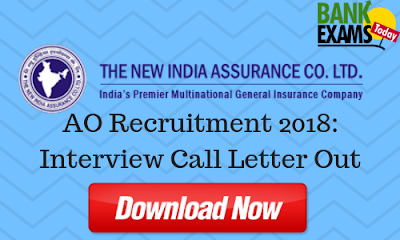 New India Assurance Co. Ltd.(NIACL) has recently released the Interview Call Letter for Administrative Officers post Recruitment 2018. You can download your Mains Exam Call Letter from here. Commencement of Call letter Download:- 28 - 03 - 2019. Closure of Call letter Download:- 22- 04 - 2019. Click Here to Download your Interview Call Letter.